Tesco appear to have reduced Glenkinchie 12 YO single malt whisky from £33.00 to £16.50 for a 70cl bottle. Seems to be way cheaper than almost anywhere else. A lovely Lowland malt whisky from near to Edinburgh. Not peaty but pretty average for a single malt tbh.. It's not that bad It has different characteristics to many other malts because of where the distillery is located. 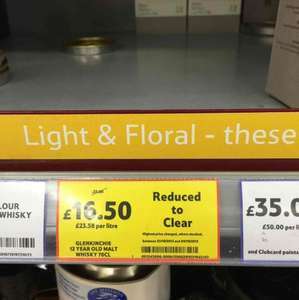 I'd say that at the price being asked in Tesco, it's worth a punt as there's nothing worse than dropping £25 or £30 on a whisky and finding you don't like it. Half price in Tesco Milton Keynes, but none left But, other very good whiskies also at half price (posted).